Welp. I'm planning on giving our homemade vanilla extract a sister. A sister homemade almond extract. This is what happens when you buy 8 lbs of cherries. I've used ~2150 pits here, and that's only about half. On the left, the cloudy liquid is homemade almond extract made from the noyeaux of ~150 cherry pits. 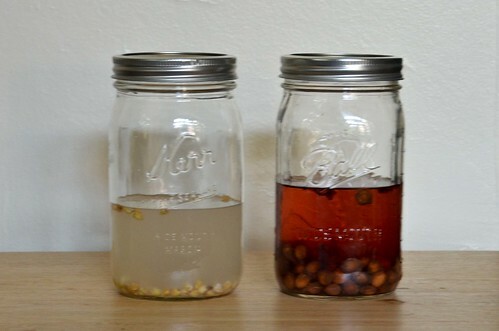 On the right, cherry pit vodka with ~100 cherry pits. I probably used too much vodka and not enough pits/noyeaux. I'll be adding some more pits/noyeaux, when I feel like attacking them with a hammer. It is its own special mess, separate from pitting cherries. Also, I feel this is important to include here: a debate about cyanide in noyeaux. I've decided to just not care. 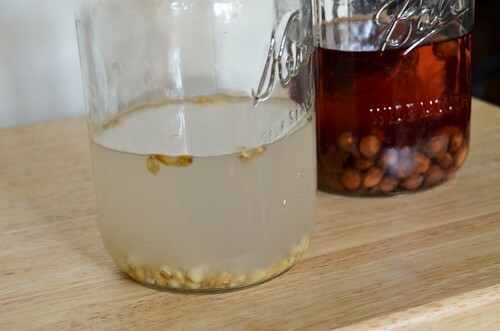 There's too many people adopting these methods for homemade almond extract, that I've decided since I'm neither pregnant nor elderly, I can probably handle it.